If someone has a personality, preferences, or interests that differ from the social norm, then I think as much as possible they should try to figure out a way to be able to do their own thing and not have to change. The world being what it is, there are times we all have to be practical and compromise, but overall people are more content when they can stay true to their nature. Accept yourself for you are and don't feel there's anything wrong with you for, say, liking your quiet time or not being irresistibly drawn to crowded bars. If you can do this, you'll have a much greater peace of mind. You'll also project a comfort, confidence and self-assuredness that will make other people more likely to think, "If he seems okay with himself, then he must be alright." This is easier said than done since we're all sensitive to people's negative judgments. The other problem is that just because you don't care about people's reactions, doesn't mean those responses can't have practical consequences. Like someone could wear the same clothes to work for a month straight and not care what their co-workers thought, but it's still going to affect their career. Still, if what you're doing isn't hurting you or anybody else, then learning to not care can ease your mind. If you continually go against the norm it's going to cause some friction. You've got to be okay with occasionally upsetting people, through no real fault of your own. For example, if you don't like parties someone may take it personally if you don't go to theirs. In their mind everyone thinks big gatherings are fun and the only reason someone would pass on one is if they didn't like the other guests or they were trying to be difficult. This advice tends to be given when someone needs a lot of alone time, they aren't crazy about more hectic social situations, or if they have Asperger's Syndrome. Basically, if they left everything to their own devices, people would negatively misconstrue their behavior. By letting them know the deal up front, they hope to avoid that. They may explain to their co-workers that it's nothing personal that they want to recharge by having lunch on their own, or why they're going to pass on a night of clubbing, or that their Asperger's sometimes leads to them coming across as more blunt and insensitive than they intended. If this approach works, then you have official approval and understanding to do your thing. A potential downside is that the people you tell may not get it and not want to accommodate you. Also, people may have some justifiable reservations about disclosing a diagnosis like Asperger's Syndrome to just anyone. Many people don't understand it, and the possible negative consequences may be too risky. Sometimes people won't accept your different social needs because they're operating under misconceptions about them. If you can dispel their mistaken ideas, they may come around. For example, they may believe that your wanting alone time is a sign you don't like them, or that someone with Asperger's Syndrome is purposely being rude, when they actually don't realize a mistake they're making. Mostly likely you'll get little chances here and there to work small education pieces into your conversations. Maybe after you've declined a party invitation you can explain it doesn't mean you're anti-social and hate everyone just because that kind of rowdy environment isn't your cup of tea. When you differ from the social norm people will often ask you to do things you're not into. You'll have to get used to being assertive and turning them down. Some standard advice on saying no is to do so in a firm, but friendly way. At times it's easier to use an excuse, while at other moments giving a more truthful explanation will help. If someone is persistent, the classic broken record technique works well, where you just keep repeating the same response no matter what other person says, and not get sucked into an argument. Eventually they have to give up. This advice is also often given in the context of someone needing their down time. The idea is that even if their daily routine isn't set up to give them long recharge breaks, they can find ways to carve out little chunks of time for themselves. They could go for a walk at lunch, or close their office door for half an hour in the afternoon. A bigger example would be someone arranging to work from home for most of the work week. When you do things like turn people down, or ask for accommodations, don't seem too annoyed and angry at the world for not understanding you. I'm saying this in the practical sense that if someone comes across as bitter, then it tends to detract from their message. People can't help but have a defensive knee-jerk reaction to how you come across emotionally and will be more likely to disregard what you're actually saying, even if you have a point. If you seem cheerful and easygoing about your social difference, but still confident that you're allowed to be this way, and assertive in asking for what you want, then people will react a lot better. "Oh, she seems like she's got her act together. She must have a point." Yeah, it does seem dumb that you have to put on the right kind of show to get what you want, but that's what I've observed tends to work. It's harder to be yourself if you feel like you're battling it out alone. You can take a weight off your shoulders by finding other people like you. This may mean joining a club to meet up with people in your city who are part of your subculture. It could mean going online and finding a forum for support. In more extreme cases it could be something like a person moving out of their constrictive, conservative small town to seek their real community in another part of the country. One well-known example of this is the IT guy at the corporate job who can get away with dressing more casually than the other employees because everyone depends on them to keep the computers running. Another example is the quirky, creative type who would probably get labeled as a weirdo, if their artistic work wasn't so good. If people need you, you have more leverage to ask for what you want. They may resist at first, and may continue to resent what they've given you. However, what can also happen is that once they accommodate you they'll realize doing so wasn't nearly as wrong as they first felt it would be. This point and the next are more long term. When we depend on other people we often have to make concessions to them. But imagine if you already had all the relationships and money you needed? You'd have way, way more freedom to act the way you wanted to and not have to submerge your identity. Say a person only has one close friend and spends most of their time working on their paintings, or programming games. Everyone thinks they're socially unhealthy and obsessively wasting their time. This person keeps doing what they're doing and eventually starts to earn a decent living as a visual artist or indie game designer. Suddenly all those solitary hours don't seem like such a waste: "Hm, and you know what? Maybe thinking about it more, they're a fun, quirky genius, not a creepy shut-in. And their clothes aren't so eccentric after all...."
Of course, no matter what you do some people still won't understand you, but having success can help. It also advances the cause of other people who are in the same point. Look at what all the millionaires in Silicon Valley did for the way we look at people who are into computers. It didn't create overnight acceptance, but it definitely shifted the conversation. Many times when someone seems to be negatively judging someone's interests or preference for being alone what they're really reacting to is their impression of how socially awkward the person is or not. Due to how people's psychology works, if someone seems awkward then everything they do will get cast in a negative light. If someone seems socially skilled, the same traits will be accepted. It's not really rational, but that seems to be how it is. There are lots of likable, charismatic people who enjoy so-called 'nerdy' things like comic books and video games, or who spend tons of time reading by themselves. However, since they make such a good impression no one cares about these hobbies at all. The same people will then turn to someone else who does the exact same things, but who's more stereotypically awkward, and think, "Wow, what a dweeb. That guy needs to stop reading so many comics and get some sunlight for once in his life." 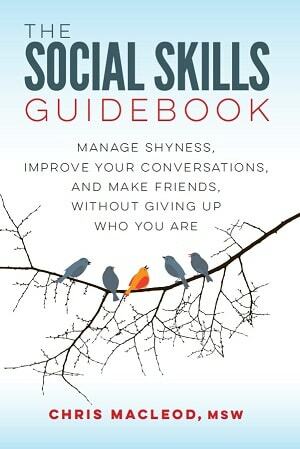 If it's something you don't mind doing, acquiring a foundation of decent social skills that you can 'turn on' when you're around people will give you a ton of freedom to pursue your other interests without any hassles. 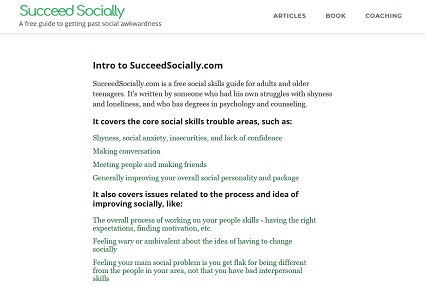 And obviously social savvy provides lots of other benefits. Of course, if the way you want to 'do your own thing' socially is to not have to care about acquiring people skills, or if you're unenthusiastic about the idea of having to learn something to please other people and get them off your back, then this point won't apply to you. Just thinking practically, there are times when we all have to compromise to keep everything on an even keel. If your job is cool with you keeping to yourself most of the time, but really expects everyone to come to the office Christmas party, then bite the bullet and temporarily put yourself into 'mingling mode' for a couple of hours. Or if you like your co-workers overall, maybe you'll grab drinks with them the odd time when they go to the pub on Fridays, even though in an ideal world you'd skip that kind of event every time.